Being a newcomer in the United States, Noa Levy looked for meaningful connections and opportunities to speak the universal language of music with like-minded people. With a beautiful, rounded voice and a magnetic stage presence, Levy is a unique and charismatic female vocalist and performer who sings with a soulful sound across genres – Jazz, Rock, Cabaret, Musicals, and Pop. Over time, she found in Dillon Vado, Omree Gal-Oz and Dan Neville, wonderful partners and creative spirits keen on exploring and connecting. Indeed, they showcase the fruit of their collaboration on this wonderful, truly delightful and uplifting new EP, Take Two (out now via Belle Records). 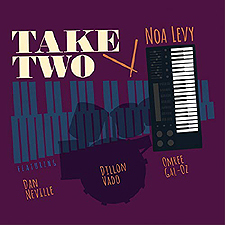 Each track is unique to it's participant and bridges their different cultures, music genres and influences, and means that from start to finish, Take Two is an album of pure, unadulterated musical brilliance. Originally brought to our attention in the mid-'50s, the gently bubblin' vibraphone-enhanced 'Social Call' is yet another beautiful showcasing of what Levy can do and that's backed by 'Someday My Prince Will Come' (from Walt Disney's 1937 animated movie 'Snow White and the Seven Dwarfs').